Sometimes one argument can kill the whole option. A price of $101 for example might force you to exclude a product from consideration completely, when your budget is strictly limited to $100. Still in the other factors the option might be the winner (likely for an expensive product). Like it would have been deleted, a killed option is excluded from scoring, only representing it's existence for documentation purposes. Later the "killer" argument might change and the option is included in the scoring again. A Bookmarklet is a special "Bookmark" on your browser, allowing you to work with the information you see on a currently open Web page. 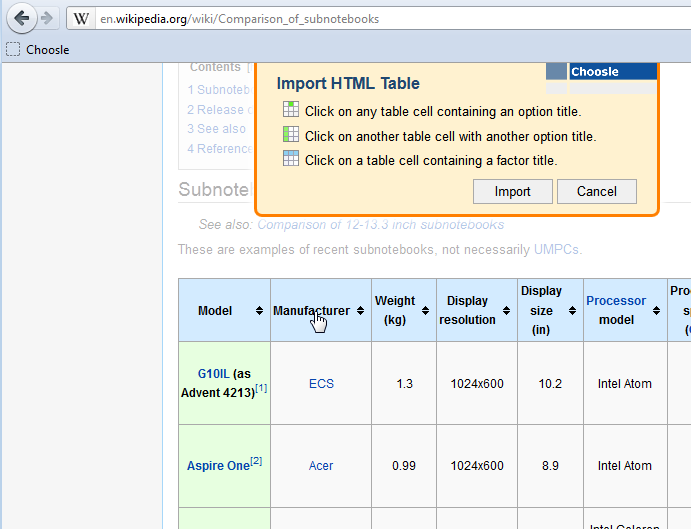 The Choosle Bookmarklet allows you to transform a HTML table into a new Choosle. 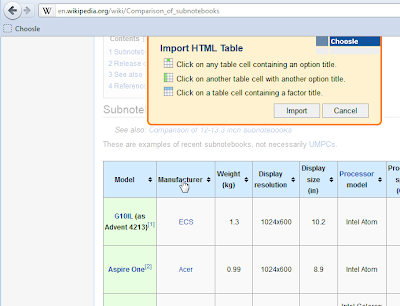 Drag the Bookmarklet link from the Import dialog (manage - Import) into your bookmarks toolbar, browse to the Web page with the HTML table to import and click on the Bookmarklet. Then click on any table cell containing the title of an option. Next click on another table cell with the title of another option (=> selects the row or column with the options). Last click on a table cell containing the title of a factor (=> selects the column or row with the factors). and the factors in the first row. A click on the Import button creates a new Choosle with the selected options, factors and fills in the arguments from the HTML table contents. Instead of having to switch between the 5-star and the +/- slider rating modes, the +/- slider ratings now show a 5-star control on mouse-hover, allowing you to quickly input a rough rating value with one click. The slider position automatically moves with your star selection.